Last week I posted about a quilt pattern I had been testing for Melissa at Sew BitterSweet Designs. The post went up whilst I was away from home and I didn't know at the time of writing that I would be lucky enough to be able to give away a copy of the pattern. Melissa launched the new patterns on Monday, you can read about it here, and see a variety of stunning quilts made using her pattern. It's quite amazing how a change of fabric or colour alters the pattern There are endless possibilities with this pattern. This is Melissa's Flowering Lonestar. I love the bright fabrics against the grey background and her quilting is just stunning. If only I had picked a simpler quilting style I might be able to show a finished quilt but I am still quilting it! So here's some pictures of the quilting so far. To win a copy of the flowering Lonestar pattern just leave a comment, anything you like. And Sew Bittersweet Designs followers get a second entry, leave a comment letting me know how you follow Melissa. If you'd like to follow me too, comment here how you do and you'll get a third entry. The giveaway is open to anyone since it's a pdf pattern, good luck. Please make sure there's some way I can contact you, in case you win. I'll draw a random winner next Wednesday, August 20. I love this!! Hope I win the pattern! I think that when you are finished, you will be glad you chose the more complex quilting design; it is gorgeous. gosh..you are doing detailed quilting...going to be gorgeous!!! 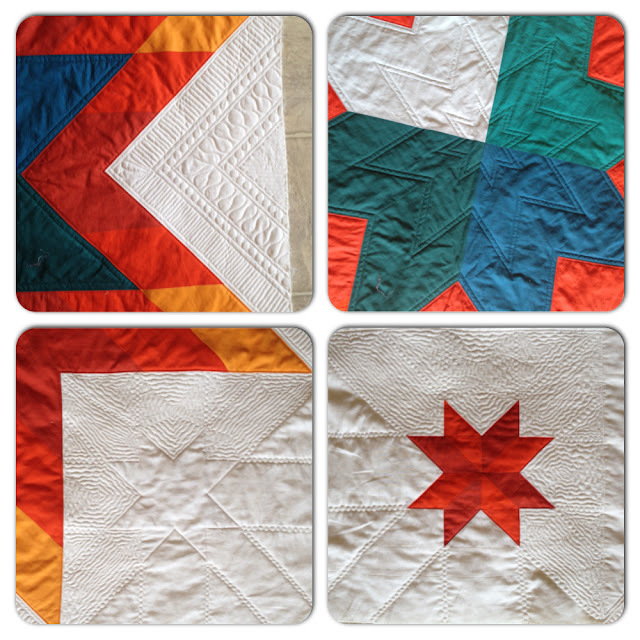 I love a giant star quilt! Thanks for the chance to win. Your quilting looks wonderful! Worth the extra time for sure. Fabulous - I love your quilting! What a lovely quilt, and your quilting looks great. I'd love to win the pattern. Stars are my favorite! I just started following Sew Bittersweet Designs on Facebook. So pretty-there's something iconic about a giant star, whatever the colours! Your quilting looks lovely. Keep up the hard work. Love this!! My DD wants a lone star quilt and since she is having her 25th wedding anniversary next year, I thought I'd try to make one. This one would be perfect!! 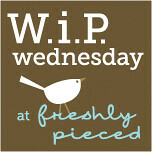 I follow Sew BitterSweet Designs on Bloglovin. This Lone Star quilt pattern would be perfect for my son who lives alone. He just recently told me he'd like a quilt! I've been watching Melissa build this quilt on her blog. It's beautiful. I follow Melissa on bloglovin. I follow you on bloglovin. Thanks for the chance to win. I love this block, I have wanted to make one for the longest time. This pattern will be the key to get me started. Thanks for the chance.